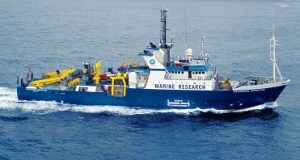 Two research vessels, the Southern Surveyor, managed by CSIRO, and the Aurora Australis, operated by the Australian Antarctic Division, ply the oceans around the continent and down to Antarctica respectively. As well as taking specific measurements for research purposes, since 1985 they have been accumulating routine “underway” data to assist their passage. Initially, this information was simply stored and taken back to the laboratory for further analysis once the ship docked. But for several years now, a suite of weather information has been transmitted directly to the Bureau of Meteorology computers for inclusion in the Global Telecommunications System operated by the World Meteorological Organisation. Now, with funding and assistance from Australian National Data Service, the rest of the underway data—to do with the ship’s movements, the state of the ocean and sea-atmosphere interaction—is being labelled and transmitted as soon as it is gathered. The data, including archival information, is available to all through Research Data Australia (researchdata.ands.org.au) and the Australian Ocean Data Network (AODN) at portal.aodn.org.au. Many other commercial vessels, collectively known as ships of opportunity, also carry instruments that provide measurements across Australia’s surrounding oceans: this data is also available through the AODN portal and Research Data Australia.